Hi. I’m wondering if you have any tips for beginners on how to overcome feeling silly when practicing drills in a public pool when everyone else is swimming “normal” laps. I know it’s simply a mental shift but I can’t seem to get past it. Thank you. Let me start by saying that this is a fantastic question to throw our way in January! So many people are diving into new fitness routines as they pursue their New Years resolutions. My gym has been so busy that I almost can’t find parking. There are people who have never worked out a day in their life and there are seasoned veterans. It can be very intimidating to try something new or different with so many people around, especially in an unnatural environment such as a swimming pool. Fortunately, we have a few ideas to help you. Look the part. Wear a full body racing suit, fins and some really badass goggles. Everyone will assume you know what you’re doing even if you look like a dying manatee. Pretty soon they’ll all be trying to swim like a dying manatee too. Okay, maybe that isn’t the best advice. Some better advice might be to remember that most people are so absorbed in themselves that they won’t even notice what someone else is (or isn’t) doing. Our generation is the most narcissistic generation of all time. We’re too busy posting selfies to worry about what someone else is up to. If you act confident, no one will be aware that you have insecurities and doubts on the inside. Follow the rules of the pool and be respectful of your fellow lap swimmers. The only time I notice other lap swimmers is when they aren’t aware of what is going on around them to the point that they are getting in other lap swimmers way. There is a time to split a lane and a time to circle swim. Most pools post their rules on deck as well as put up signs that designate which ability swimmers should practice in each lane. Be honest with yourself and your abilities. If you can’t hang in the fast lane, there is no shame swimming in the moderate or slow lane. You can always improve but it is really selfish and lame to hinder someone else’s improvement. As long as you follow the rules your pool has posted and treat other people with the same respect that you want to be treated with, you’re going to avoid 99% of lap swim issues. Start with drills that are a little “less” weird. Drills that are very close to actual Freestyle like Fingertip Drag or Catch Up Drill are great starting points. Eventually you can build up to kicking on your side, Finishing Drill, or other “obvious drills” like Heads Up Freestyle. Wear fins if you need to and remember that it is okay to save the really “weird” stuff for a time that you feel more confident about your stroke and ability. Swimming is a process and improvements don’t happen overnight. Most drills are inherently goofy looking because they’re designed to overcorrect stroke issues. Even seasoned swimmers probably look funny to people that don’t know what drill they are doing. Be consistent and regularly get in the water. The more consistently you practice, the more natural swimming is going to feel. Make a goal of swimming three times a week and see how that helps you. Most swim teams practice twice a day, so many of the lap swimmers with swimming backgrounds that you think have a “normal” stroke have dedicated a lot of their time to get that way. We all start somewhere. All of us. Most of us remember what it was like and would never dream of making someone new to the sport feel awkard about it. 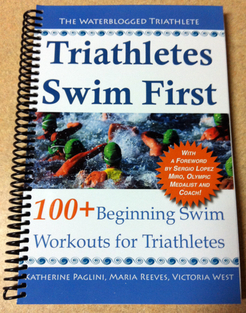 In fact, most swimmers and triathletes I know are very accepting and encouraging to new athletes. Anyone that isn’t has their own issues they’re dealing with and isn’t worth your time. Swim with a group or team. Sometimes it helps to join a team. Having everyone work on the same drill at the same time can help it all feel a little more normal. Use the resources you have available to you. Videos from youtube, a local swim coach, private lessons, etc. I’m so glad you thought to reach out to us! We are glad to help where we can! Move on. If you make a mistakes (and we all do) don’t dwell on them. Try your best to acknowledge it and move forward. If you accidentally get in another swimmer’s way, you might say something like, “I’m sorry! My name is ____ and I’m new to swimming. I was so focused on this weird drill I’m trying that I accidentally crossed over the center line. I didn’t mean to crash into you and I’m working on this so it won’t happen again.” Then learn from it and move forward. I saw footage from Nationals (or maybe even Trials) once where Natalie Coughlin zig-zagged during backstroke until she was right on the lane line. At the end of the race, someone interviewing her called her out on it because this isn’t the type of mistake Olympians usually make. Natalie acknowledged that she was working on it and moved on. It was brilliant and a wonderful teaching moment. We all make mistakes, mistakes are how we learn. Don’t let the fear of mistakes/looking silly hold you back from your goals!!! Have fun! Seriously, if it isn’t fun then what’s the point? If you can have a sense of humor about the process it is going to help you feel more confident because you’re going to stop being so hard on yourself. It is important not to dwell on things or let your apprehension about what other people are thinking affect your workouts. Relax, relax, relax. You can do this. And you know what? Even if you can’t do it perfectly, at least you’re trying and that’s way more than most people can say. Don’t go under a lane line to switch lanes or get out of the pool without making sure the coast is clear because it is very rude to suddenly appear in front of a lap swimmer and force them to stop so they don’t crash into you. Guess what? Not one of those tips has anything to do with the way you look swimming drills because the other lap swimmer’s don’t care how silly you look. You do what you need to do to improve. The other lap swimmers will be doing what they need to do. I hope you are able to get over your mental block. We believe in you! Now you just have to believe in yourself! Anyone else have any tips or lap swim pet peeves to be aware of? Please share in the comments section. I am so lucky that the pools I swim at only double up when there are too many people. It would drive me batty to have to share one lane with multiple other people. Glad to see yall are still posting, gone quite lately,or i missed some posts. Well said! Even experienced swimmers can benefit from this reminder about lane etiquette and fostering a welcoming, encouraging environment to all. Thank you. Thanks! I think so too. I’m happy to say that most issues I’ve seen as a swimmer/coach have more to do with etiquette side versus people being mean for the sake of being mean. I think most people do a good job encouraging others, but there are always exceptions. I hope this piece helps people that are worried about what other people might think about them whether it be swimming or something else! What a great question (and answer, of course). I had many of the same feelings when I started drills and I totally agree that most other swimmers wouldn’t notice what you were doing unless you grabbed them and forced them to watch. Once I got into the drills, I found that I was concentrating so much on the drill that I soon forgot about other people and lost any inhibitions I had. (Don’t concentrate too hard and crash into them though – see tip 2)! Not only that, but on one occasion I was spotted doing drills and was accosted when I stopped for a break. The person had seen that I was working on my stroke and, far from being ridiculed, they were able to offer me some tips, having seen what I was doing and, crucially, what I was doing wrong. You also make a good point about the person that helped you by providing some tips. Not to make you feel silly, but to make things easier for you next time. I really believe most people are going to fall into the helping a person out category vs. being mean category. It is also okay to ask someone for tips/advice, just make sure you wait until they’re done with their workout so you aren’t interrupting anything! Truth!!! It is all about focusing on yourself and what you need to do to become better. It takes practice but definitely gets easier with time. I can just imagine you doing fartleks in your neighborhood and honestly, I bet some of your neighbor kids remember it when they’re older and think of you from time to time when they’re working out. They might not know your name but they’ll remember your dedication and (I hope) be able to understand/apply it to their own fitness routines. I finally made it to the pool today for a swim. It took me a few weeks after reading this post but I got there today. And surprise, surprise, I had the entire pool to myself! Bliss. 🙂 I wonder how often I haven’t gone because of this fear, when I might have had nothing to worry about at all. YAY! I’m glad you made it out for a swim but I’m a little bummed the pool was empty, lol. I want you to be able to feel confident when others are around you. Perhaps it will take some time, and maybe you’ll be lucky to always find the pool empty if you swim on the same day/time now that you know it was empty once. Just remember, you belong there as much as anyone else. Don’t let your fears keep you from your dreams. You also have to start thinking about that mass swim start and it will be good practice to go during a busier lap swim time when you feel ready!!! All the best, I hope you report back to us after you have some more practice and experience under your belt. You got this!! !